Guest writer Yvette Larsson spoke to Romanian artist Alina Zara of the Mandra Chic workshop, where children and adolescents learn how to make their own Romanian blouses – IE. She also talks to some of the girls learning this traditional craft. Tell us about your group : who are you? Mândra Chic is a workshop within the Museum (of Stories and Fabrics) in the village of Mândra, in the historical region of Făgăraș, Transylvania, Central Romania. A unique studio for authentic, traditional Romanian creativity where we devise a fusion of old and new without pretense of absolutes. A kind of local artistic gathering, made in a modern fashion. We seek to rediscover and pay tribute to traditional Romanian fabrics, we recreate and refresh them, celebrating them in urban and contemporary ways, promoting and making them into an art form. We make authentic souvenirs; we have a line of unique T-shirts (Tricoul Fain, The “cool” shirt), with classic fabric motifs and traditional texts, the T-Shirts with the national flag and symbols woven in, little badges called “mândruţe” (a play on the village name, roughly translates also as “beautiful young women”), made from wool, lace and manually inscribed leather, the “Romanian corner” – decorative pillows, a re-imagining of a folk tale, as well as postcards with stories, and more. Tell us about the museum: what activities are you doing there? The Museum of Stories and Fabrics is, first of all, a concept. We also have a real house, which we use to host our creative workshops, expositions, campaigns, camps and playtime. For now, it is still a work in progress, but among the restoration works we sneak in some of our own. At the same time, the collections of local fabrics and stories are always ready for the road and for exhibitions, as well as national and international projects. One that is very dear to us is the traveling weaving loom shuttle. It belonged to my grandmother and when she passed, she wanted it to see the world in her place. So now it is doing just that, traveling around the whole world. It is often hailed as one of the most interesting travel projects today. The shuttle has journeyed over a million kilometers, it has its own personal travel blog and hundreds of friends the world over. Right now it is in China and preparing to go on an adventure in a Romanian gulag in Siberia. Tell us about Mândra, the village. Mândra is a village in the historical region of Făgăraş. 7 km away from the city of Făgăraş, it has suffered many architectural changes lately. Contact with civilization has diminished its original charm. In the days of the Communist dictatorship, most of the people worked in the factories of Făgăraş. They earned well, they worked hard and radically transformed the village. Thus, the houses are mostly of 50s and 60s architecture. The one in which we host the Museum we restored ourselves and is one of the few that date to the early 1900s. The church, on the other hand, the one to which you have to climb 81 steps to get to, is a historical monument. It was erected in 1779 and consecrated in the name of the Holy Trinity, it has a beautiful cupola like a cathedral’s, and unique frescoes; it is impeccably restored and its altar is finely dressed in local fabrics from the village. The people of Mândra are right to believe they have the most beautiful church in the world. Tell us about the IE, and why you are making your own ? 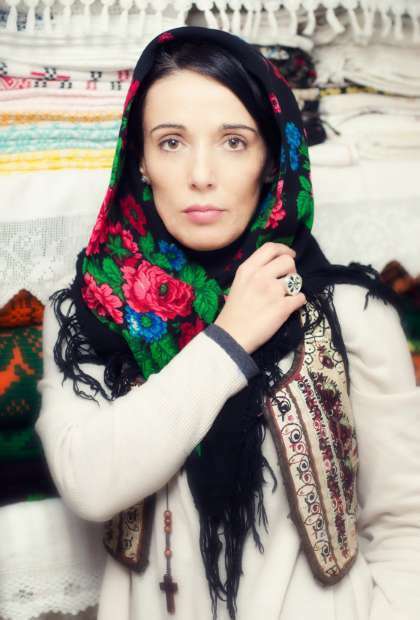 The “ie”, the traditional Romanian blouse, is the most popular symbol for Romanian women. It has represented them since the days of our ancestors. Every woman would weave her own, each according to her own personality, her community and social standing. In the old days, you could read a woman with one look, judging by her blouse. It is a work of art and has a fabulous destiny. Leading world designers have reinterpreted it, famous artists have painted it, and international celebrities have worn and are wearing it still today. In other words, it’s a national brand. I would love to see it listed in as part of world heritage. It deserves that honour. And I would like women who wear it to know it is far more than an item of clothing. It’s a work of art, a symbol, a state of mind, a story as old as the world. And it is a Romanian story. Because we are friends of the “Blouse Roumaine” community, who have managed to create an International Day of the IE, we decided to celebrate the 24th of June, the local festival of Sânziene (“the fairies”) with our own IE. Our grandmothers would make their first when they were no older than the girls in our workshop. Aged 10-12, they made their own Sunday clothes. At 16 they would marry in the blouses they had made. Each one is a story. Every woven symbol is a message, every color, string, every bit of lace that adorns the cuffs, the neck and lap. The girls are fascinated by each IE they discover in the attic, in dowry chests, in the wardrobe, at their aunts and neighbors, in museums and private collections. They don’t just have one, they already have 2 or 3 each, which they keep in their wardrobes. They wear them at least once a week and now they want to make one of their own. I know the story of each symbol in the workshop for woven symbols made by our dear friend, the architect Ioana Corduneanu. And so they want to become designers in their own right, choosing the symbol that is closest to them, the one that is most aesthetically pleasing but that also carries important meaning. In their minds it plays out like a film, how they will have a different set of blouses, one with its own story, which they will wear depending on what they want to say. For now, we have started a weaving workshop, where we invited the artist Simona Ciuban; she has a creative workshop where she designs new artistic interpretations of the traditional IE. Every girl has received a bit of cloth on which she learns to sew. With these we’ll make shirts that say “my first sewn symbols” or “my first blouse attempt”, etc. Let each girl choose one symbol that is special to her and tell her to share why. What does 'culture' mean to you? Speaking of culture… well, combining my discourse with the one of girls who make their own blouses, we get something like this: culture represents that which is most beautiful, valuable and respectable. Basically, it means that when you have guests over, you don’t walk around the house in your underwear. It’s important to cultivate in ourselves and our youths a sense of balance and dignity, of purpose and tradition. This is increasingly important in a world where people greet their guests in their underwear, metaphorically of course. What is the beauty of Romania? What are the deep, profound meanings and values of Romania that can inspire us in the west ? Being patriotic and showing respecting to your roots leads to a fantastic kind of universality. Having your own individual personality, you can lay down a stone on the foundation of a new world. You can’t contribute to universal values by bringing some souvenir trinket, no matter how cute you think it is, or with a tribal tattoo that you got a long time ago when it was all the rage. It’s just not how it’s done. You can’t add to the great monument of world values if you cut off your own roots. This is where it all begins: with a seemingly innocent, almost unconscious break from our roots. Nothing of what is being created today by the industrial power of big brands and corporate goods and companies, none of it is really ours, it is nothing like us. We have a sacred duty to uphold our own values and not those of others. Because we cannot give anything to our children except that which belongs to us. For me, the most important things are true Romanian values and Christianity. Silvia, 16 years old: “I love it when grandma tells the story of how she made her first blouse. I want to have a story of my own. From all the designs I chose the peony, symbol of vigor and youth, something representative of us young girls, I’ll also sew a flowing water pattern and at the cuffs and neck I’d like to do the meander. Cristina, 13: I’d like to make it as a display of attitude and authenticity to the kids of my generation for whom these sort of things have no value. I’d like to make them understand how “cool” these symbols that I wear really are, especially if I can do this with something that I’ve made myself. And there’s another reason: my grandmother’s joy when she sees I’ve started sewing. I’ve found an old cuff and from that I want to start my new blouse. I will be black and blue. For the symbols, I like the meander, the reel, the North star which figures prominently in our village, and I also like the cuckoo. Diana and Casiana are 17, they’re known in their school as lovers and wearers of the IE. They can’t pick one symbol; if they could, they would use them all. Each one is powerful in its own way and meaningful for key moments in life. Andreea and Georgiana are 12 and 11, respectively. They’re best friends. They want matching blouses, and they want to pass them on to their grandchildren, like their grandmothers before them. “I think about how great it will be when we will both be old and still friends and we’ll take out of our dowry chests two identical blouses to dress our granddaughters, and the wonderful stories we will have to tell them about our times. Isn’t it great?” They chose the meander, the reel and the peony. Georgiana is 10 years old and has recently lost her grandmother with whom she lived. Her first IE she wants to make in memory of her and the moments they spent together, when she would dress up in the blouses that gran had made for her daughter. She is sure that her grandmother will be happy and help her from above, even if she is the smallest of the girls. She wants her ie to have the peony. She also likes the dance of the girls, which she has sewn impeccably on her trial piece, but the peony seems more appropriate for her age. And it’s easier to sew. Alina Zara herself says that her favorite is the cross, as a symbol of supreme sacrifice in the name of love, of rebirth and salvation. I am Orthodox Christian and I believe in everything this symbol has stood for in the past 2000 years. It is an ancient symbol of universal culture, one of the fundamental symbols along with the circle and square.